MANILA, Philippines - The official results, list of passers, top examinees and other important announcements for March 2017 Civil Service Exam - Pen and Paper Test (CSE-PPT) both for professional and subprofessional levels are released by the Civil Service Commission (CSC) forty one (41) days after the last day of eligibility examinations. 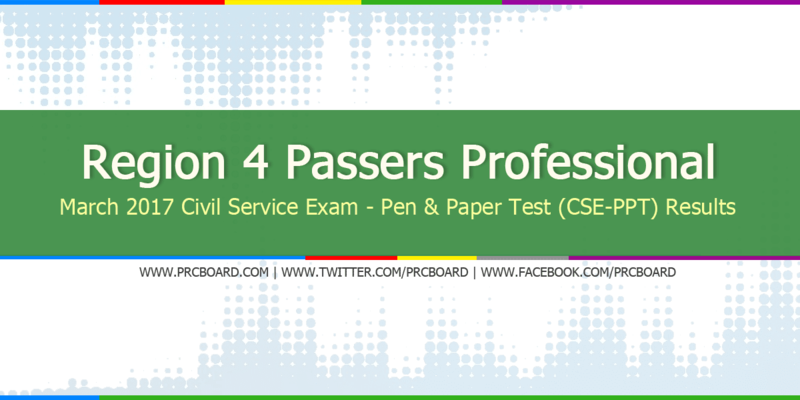 Below is the complete list of passers for March 2017 CSE-PPT Professional Level in Region 4A and 4B (MIMAROPA & CALABARZON, Southern Tagalog Region). please lord I needed this! May results n PO b? Kailan po ilalabas ang result? Sana ilabas na para malaman ko kung nakapaso ba ako hehe love you guys! Wala name ko. I really tried my best na. Pumasa ako!!! Ang problema mali spelling ng Jhon. Ayos lang. Sanay na ako lagi namamali spelling ng John kasi mas common ang John kesa Jhon. Sana makapasa na brother ko next time. Kelan ilalabas yung sa August? dapat may ratings din. or may ibang info other tha just names.